Many businesses neglect local pay-per-click advertising, because they believe it will limit their reach to a certain geographical location, and they want to target as many people as possible. But targeting everyone doesn't mean you are reaching everyone. What’s more, competing against giant companies with massive budgets can be very challenging, if not pointless. However, competing with them on local search is possible. It is a common misconception that only location-bound businesses, like brick-and-mortar stores, can take advantage of local PPC. In reality, even companies that operate completely online can make good use of this tactic and tailor. By executing a successful local PPC strategy businesses can ensure they are making the most of their advertising spend. As part of the new study, SEMrush analyzed over 86,000 keywords in 17 niches, including both offline and online companies — from Cryptocurrency and Electronics to Fashion and Travel. The list of keywords analyzed included both high-volume and low-volume terms, as well as short-head and long-tail keywords. Based on the data provided by the newly released CPC Map tool, they found out how the costs of advertising differ across the United States. The results of the study showed which states are the most and least expensive in terms of online advertising in general and for specific verticals in particular. 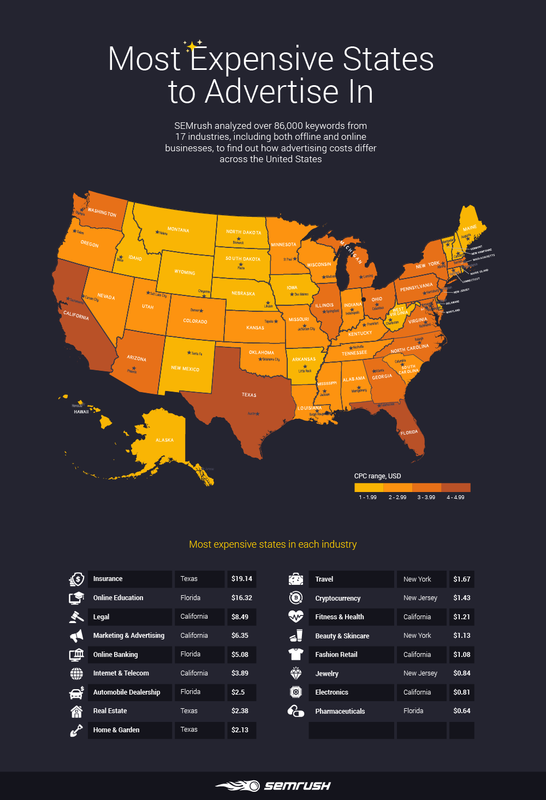 Below is a map with the U.S. states color-coded by the average cost per click. As you can see, Texas and Florida lead the list. If you work in the Insurance, Real Estate or Home & Garden industry, Texas is the state where advertising costs are the highest. Florida is the most expensive state for advertisers involved in Online Education, Online Banking, Automobile Dealerships, and Pharmaceuticals. If your business is related to Legal, Marketing & Advertising, Internet & Telecom, Fitness & Health, Fashion Retail, or Electronics, it will be most expensive to advertise your services in California. Those who work in Travel and Beauty & Skincare will have to loosen the purse strings to advertise in New York. Finally, keywords from the Cryptocurrency and Jewelry industries have the highest cost per click in New Jersey. Even when it comes to the same product or service, the costs of advertising may differ significantly depending on the location that you are targeting with your ads. Nevertheless, according to the study, not all niches are equally location sensitive. This means that in some industries the average CPC differs greatly by state, while in other businesses the CPC range is rather small. In Insurance the cost per click strongly depends on location: on average you spend $5.51 for a click in Alaska and $19.51 in Texas. This industry is one of the most expensive niches in terms of cost per click. In more than half of U.S. states the average CPC is higher than $10, and the “cheapest” click in Insurance costs more than the most expensive average click in several other verticals. At the same time, the CPC range in Jewelry is the smallest one: from $0.44 in Wyoming to $0.84 in New Jersey. It is similar to the Pharmaceuticals and Electronics industries, where the average CPC falls within the range between of $0.09 in South Dakota and $0.64 in Florida (Pharmaceuticals) and $0.09 in Montana and $0.81 in California (Electronics). In the Online Education business the average CPC ranges from $3.46 in Vermont to $16.32 in Florida. This industry is another expensive vertical for PPC, especially if you want to advertise your services in Florida, Georgia ($15.51 for a click), Texas ($14.29), or California ($14.25). There are a few more verticals where the CPC heavily depends on location: Legal ($0.33-$8.49 for a click), Marketing & Advertising ($0.26-$6.35), Online Banking ($0.55-$5.08), and Internet & Telecom ($0.23-$3.89). The cost per click in the Automobile Dealership, Real Estate, and Home & Garden industries is less dependent on location. The average CPC ranges from $0.36 in Wyoming to $2.5 in Florida for Automobile Dealership, from $0.29 in Wyoming to $2.38 in Texas for Real Estate, and from $0.55 in Alaska to $2.13 in Texas for Home & Garden. Travel, Cryptocurrency, Fitness & Health, Fashion Retail, and Beauty & Skincare proved to be less location sensitive industries too. The most expensive average click in these niches costs no more than $1.7. Local PPC is a strategic way for businesses to get their message out to the right people who are actively looking for the products or services that they offer. Tailoring your campaign to a specific location can help you effectively optimize your advertising spends and improve the efficiency of your marketing activities. Nevertheless, it goes without saying that there is no one-size-fits-all approach. So it may be worth analyzing how advertising costs vary in your industry and using this data to plan your PPC campaign. The data presented in this study is just a small part of what the newest SEMrush tool provides. CPC Map shows local keyword metrics and gives various actionable insights, which digital marketing specialists can use to invigorate their advertising activities. With the tool, you can check the average CPC in 13 countries (the US, the UK, Canada, India, Australia, Brazil, France, Germany, Austria, Italy, Spain, South Africa, and Russia), compare costs across 17 industries in a chosen region, and check how the cost has changed during the past months in a particular niche and state.